Genuinely two-footed players are a rare commodity (and appear to be paid accordingly). A study of 'footedness' during the 1998 World Cup found that less than a quarter of shots by right-footed players were taken with their left foot, and less than one in six by left-footed players were taken with their right. Only a tiny proportion of players appeared to be equally comfortable shooting with either foot. In this post I'll take a look at the frequency with which attacking players in the English Premier League shoot with their weaker foot, particularly from distance. 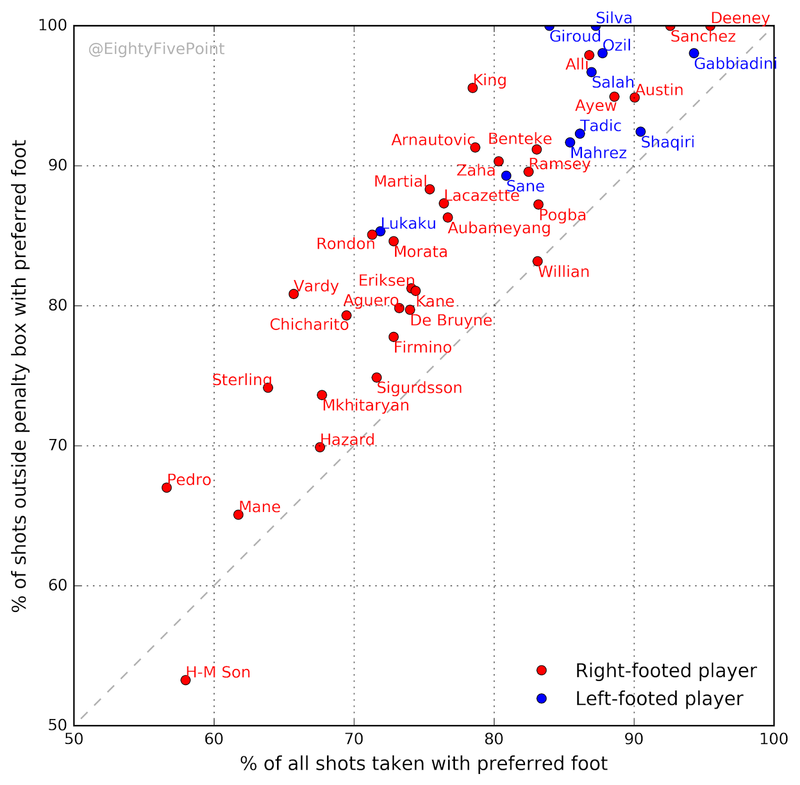 The results are surprisingly diverse, with some high-profile players almost exclusively using their stronger foot, while others are significantly more willing to shoot with both feet. I'll finish with shot maps for players on either end of the spectrum, looking for patterns in the locations at which they choose to shoot with each foot. Figure 1 shows, for a sample of current EPL players, the percentage of shots (excluding penalties and headers) that were taken with each player's preferred foot (x-axis), against the percentage of shots from outside the penalty area that were taken with their preferred foot (y-axis). Right-footed players are coloured red, left-footers are coloured blue. 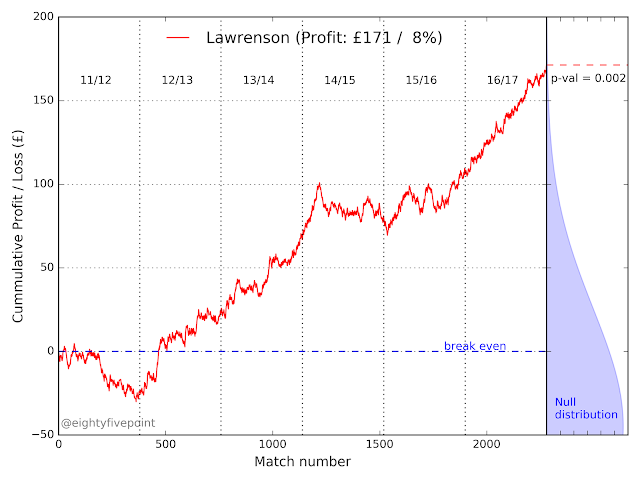 The data was obtained from Understat and Transfermarkt. Figure 1: The percentage of shots (excluding headers and penalties) that were taken with a player's preferred foot, against the percentage of shots from outside the penalty area taken with their preferred foot. Red points indicate right-footed players; blue points, left-footed players. On average, the players shown in Figure 1 hit 78% of their ground shots with their preferred foot; outside of the penalty area this increases to 86%. Left-footed players are more reliant on their left foot (85% of their shots) than right-footed players are on their right (76%). 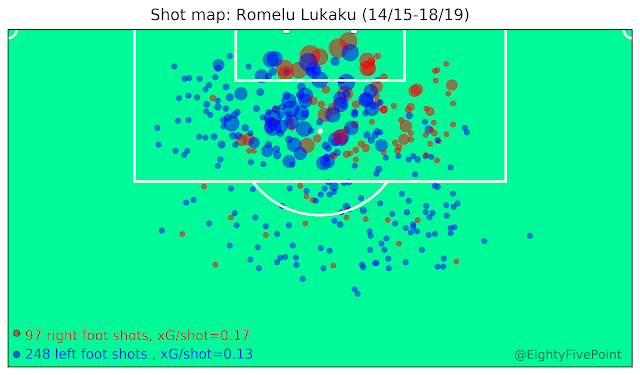 Indeed, Lukaku is the only left-footed player that has taken less than 80% of his shots with his stronger foot, whereas more than half of the right-footed players are below 80%. Perhaps managers tend to deploy their left-footed players in ways that amplify the impact of their left-footedness? Troy Deeney is the most one-footed striker in the EPL: 126 of his 132 shots (95%) in the last four seasons were taken with his right foot. Manolo Gabbiadini (who is left footed) and Alexis Sanchez (right) are also extremely one-footed, both taking over 90% of their shots with their preferred foot. Sanchez has not taken a single shots with his left foot from outside the area in the last four years, which seems surprising for a player of his quality. 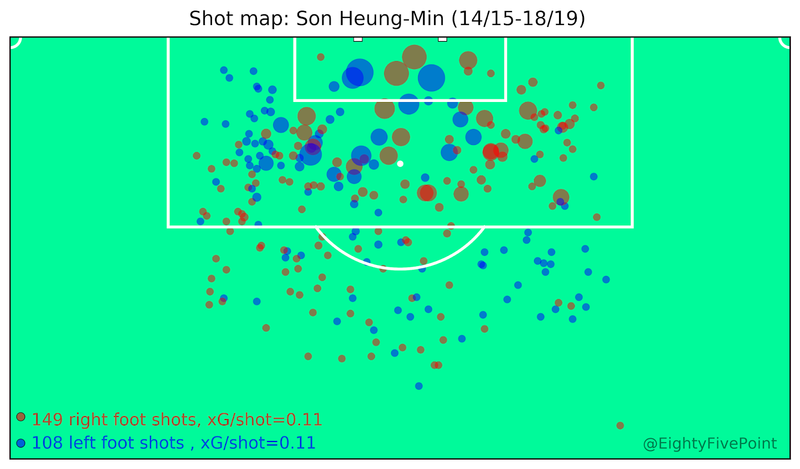 At the other end of the spectrum we have Heung-Min Son and Pedro, both of whom take (and score) more than 40% of shots with their so-called weaker feet. Indeed, transfermarkt list both players as having no preferred foot -- I assume that they are right-footed because they both take penalties with that foot. 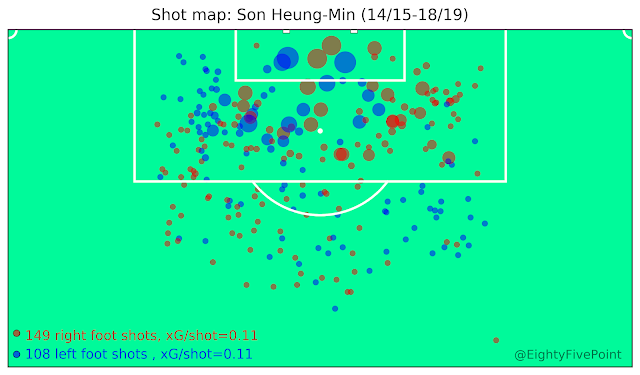 Son is the only player shown in Figure 1 that is equally comfortable shooting with either foot from range: 43 of his 92 shots (47%) from outside the penalty area since the 2014/15 season have been on his 'weaker' left foot. He is the most two-footed attacking player currently playing in the Premier League. The plots below are shot maps for a selection of four players -- Alexis Sanchez, Heung-Min Son, Pedro and Romelu Lukaku -- showing all their shots (excluding headers and penalties) since the 2014/15 season. Right-footed shots are coloured red and left-footed shots are coloured blue. The size of each circle indicates the expected goals value for that shot (down to a minimum radius). The shot data was taken from Understat. Sanchez's shot map emphasizes how one-footed he is: only 7% of his shots (30 out of 375) were taken with his left foot in the last four seasons, and none from out side the area. He's often deployed on the left-hand side, so his shot positions are skewed to that direction; but irrespective of angle to goal he clearly prefers his right foot. The majority of his left-footed shots have been very short ranged, within -- or close to -- the left side of the six-yard box. The next map charts Heung-Min Son's shots, probably the most two-footed attacking player currently in the EPL. There is a clear pattern to his foot usage: within the penalty area his left-footed shots are from the left side of the area and his right-footed shots are from the right. Outside the penalty area this reverses; he's more likely to cut-in from the left and shoot with his right, and vice versa. There is almost no trend with distance: Son is happy to shoot from range with either foot. 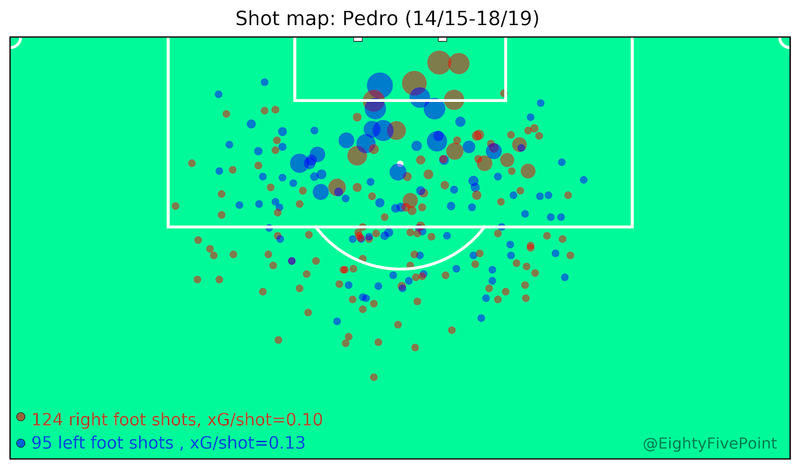 Pedro is another player that shows a willingness to shoot with either from almost any distance. 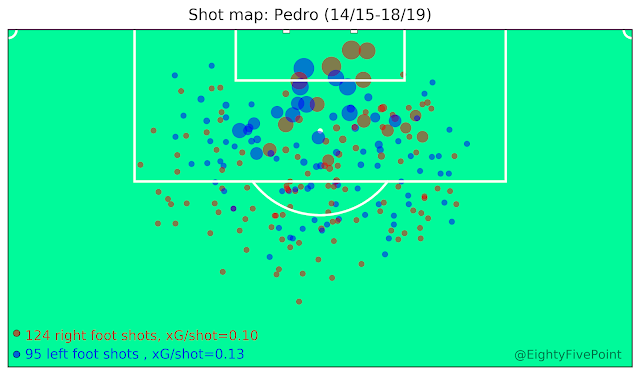 The pattern of Pedro's shots has less structure that Son's, showing no strong preference towards either foot at any location within the penalty area. Two thirds of his shots from outside the area are with his right foot; his left-footed shots from range are predominantly from the centre or right-hand side of the pitch. Lukaku is the most two-footed of the left-footed players plotted in Figure 1, taking over a third of his shots in the penalty box with his right foot, and over a quarter of all his ground-based shots. He predominantly takes right-footed shots from the right side of the penalty area, while his left foot dominates on the left side and outside of the penalty area. Why do so many players show so little enthusiasm for shooting with their weaker foot? It would seem advantageous to be effective on both feet: one-footedness presumably makes a player a bit more predictable. We know that Sanchez, Deeney and Gabbianni are unlikely to shoot with their weaker foot, so defenders should know that they can safely manoeuvre them to that side. On the other hand, with the rise of tactical micromanagement, player's roles are becoming increasingly choreographed, so perhaps there is little demand for them to do more than precisely execute a specific set of instructions. 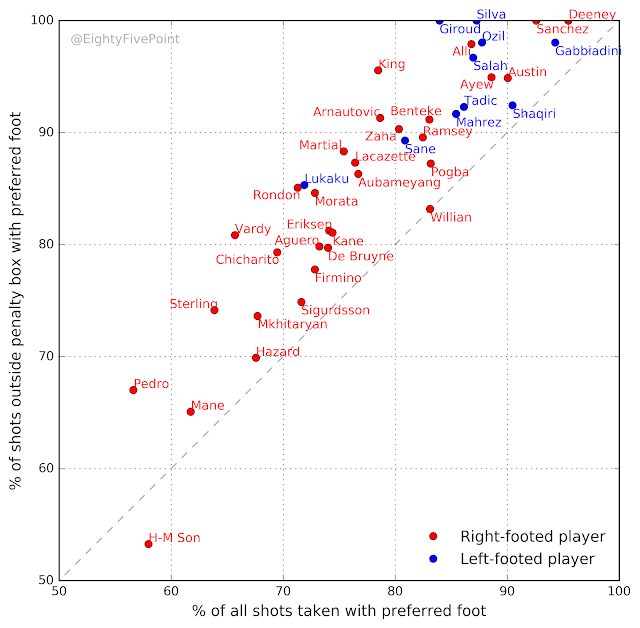 This could even explain why left-footed players seem to rely on their preferred foot more than right-footed players: after all, they are rarer (roughly 20% of players are left-footed) and are therefore more likely to become specialists in certain positions. Showing a strong preference towards shooting with a particular foot doesn't necessarily reduce a player's effectiveness. Mohamed Salah takes only 13% of his ground shots with his right foot (as does Gareth Bale), and Arjen Robben has spent his entire career shooting almost exclusively with his left foot. Even Lionel Messi -- another left-footer -- takes only 12% of his shots with his right foot (Ronaldo is up at 30% on his weaker left foot). This implies that these players are often able to manoeuvre themselves onto their preferred foot, or will simply to pass up opportunities on their weaker foot that they would have taken on their other side. It would be very interesting to study this in more detail. Finally, it's worth pointing out that the results shown here say nothing about the effectiveness of a player on either foot. To do that we must compare the rate at which they score goals with the quality of the chances that fall to each foot, as described in my last post. However, the data is too sparse to really shed any light on this: how can we assess Alexis Sanchez's left foot if he never uses it? A list of the most two-footed forwards currently playing in the big European leagues can be found here. colunistafla é o melhor site de futebol!